Metric: Dire Boars. Hulking, slavering beasts with steaming breath, spiked collars and sharp tusks and likely set with a howdah driven by crossbow-wielding kobolds. 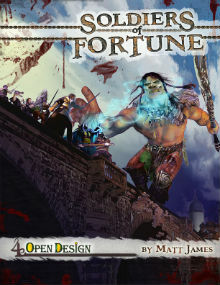 DISCLAIMER: Review based on PDF review copy provided by Open Design. You can base an entire campaign around this book. Though a general sourcebook, the use of Midgard as a backdrop provides flavour and elements tied into the Midgard mythos. While the book suggests you use what you like, some options (like the mercenary background and it's feat trees) build heavily on other elements which take a game in certain directions meaning you'll probably end using most of the book anyway. Great if you're running a war-heavy campaign in Midgard. If you want the occasional epic battle, you'll need to be selective and quite ruthless in your adaptations. Going To War notes the importance the reason for war. Some are suggested, offering plot hooks for each tier. While some arguments sound similar, salient reminders on terrain, elevation and the different nature of battles by land, sea or air add flavour. Suggesting Warhammer for 4E mass battles though? Interesting. The first step of that voyage can be started here. Those happy with 4E may want to consider the use of Greywulf's War Machine hack. War in Midgard provides an overview of the races in Midgard. The styling of dwarves and goblins as 'the sovereigns in steel' is a nice touch. What wows here are the skill challenges. These are easily transplanted into any game where war or epic scale is encouraged. Fighters may find these tricky without a useful background, multiclass feat or Skill Training. Other martial and combat types may find a new niche while their friends may act as advisors. Midgard Strategems is a fantasy re-interpretation of the Art of War without spies with added background options to provide tactical acumen, flavour and options. Each section has potential adventure or encounter hooks. Two legendary generals at the end offer different takes on warfare. One offers a gateway to paragon-hood, the other a worthy epic challenge. New Paths and Paragon Powers introduces new powers suited to the military. Arcane, divine, martial and primal powers are provided for a variety of levels. A new background (mercenary) and a batch of feats using it showcase the mercenary's talents across a range of classes. Some can be used in conjunction with the excellent siege engine rules in Monsters, Minions and Templates. Paragon paths run along each of the four main domains but along the common theme of war. Spoils of War offers magical items such as banners, standards and guidons. Midgard-relevant examples are provided with the Flag of Humentu and Gonfalon of Meretis being particularly inspired. Rituals as martial practices was mentioned in Martial Power 2 yet done much better here. These rituals support the military campaign and help exemplify why rituals are one of the under-rated shiny bits of 4th edition. One real gem here is the use of History skill to assess heraldry in the field - while not much is made of it beyond the text box, the potential for campaign detail work is significant. The Battle of Sanguine-Crag Pass takes the players into rocky ground against vicious foes including a new monster and their potent leader. This scenario offers plenty of room for customisation above the obvious; it has the potential to be a convention hit given the structure and objectives. Mentioning resources on the KQ forums without linking to them though? Uncharacteristic - any KQ fans wish to share where they are? Monsters, Minions and Templates does what it says on the tin. Siege engines as creatures supported by a dedicated crew lets a party re-enact The Pride and The Passion with their own cannon. This alone makes it excellent in my considered opinion. Using templates to modify monsters is pragmatism (monster themes from DMG2 aren't in GSL) and can easily be used to assemble a truly colourful band of brothers. Fear the kobold saboteur! Example monsters for the major races of Midgard are provided for more ready-made combat. There are some nice ideas for minions, the minion horde builds a swarm of minions while the minion aura gives your necrolord something to brag about. Combining the two is intriguing, the idea of jittery conscript human rabble hordes might give the more heroic types qualms. Such is war. Example companies from Midgard are also provided complete with statblocks. The Storm Court is fearsome stuff. Malcolm McClinton's cover is excellent stuff and shows that in war, magic is a force best kept on your side. Interior art by Joe Slucher is crisp and the layout is well-decorated and distinctive while being clear to read. The PDF bookmarks are reliable. Internal hyperlinking doesn't appear here and in a couple of places would place it on a par with later Kobold Quarterly issues. Open Design excels at PDF products and this is another example of how to do it well.